Through a “grassroots” effort, the Junior League of Oklahoma City, the Oklahoma Zoological Society, the Oklahoma City Zoo and community philanthropist Christian Keesee joined hands to provide a 30,000 square foot state-of-the-art playground for the children of the Oklahoma City metropolitan area and all those who annually visit the Oklahoma City Zoo. What makes this project unique is that the playground was designed with input from 3,500 children from 38 metro schools and the entire Oklahoma City community helped supply the labor and materials to build the playground in ONLY 10 DAYS during the weeks of March 22nd and March 29th, 2004! A vision that began in 1998 during our 70th anniversary became a reality in 2004. Together, the Junior League of Oklahoma City and Christian Keesee entered into a partnership in 1998 to provide a lasting legacy in our community. A fund was set up to honor the Oklahoma City Junior League’s 75th Anniversary and memorialize Mr. Keesee’s grandmother, Eleanor Blake Kirkpatrick, who believed strongly in the mission of the Junior League. The purpose of the fund was to finance a highly visible project in the arts and education within the Oklahoma City metropolitan area. Because the League’s mission is to promote and train volunteers, we determined that a community-build project would be an ideal endeavor. 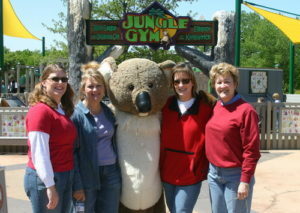 Once the decision was made to partner with the Oklahoma City Zoo, all involved in the project agreed that by working together, we would be able to promote volunteerism, improve the community through effective leadership, train other community volunteers and support the project exclusively for educational and charitable reasons. This $1.35 million playground project was made possible through the efforts of over 5,000 volunteers and with the support of more than 100 businesses providing donations of food, tools, manpower and building materials. With the guidance of New York based architecture firm, Leathers and Associates, Inc. and their expertise in developing unique, one-of-a-kind community-built playgrounds, our vision became a reality. After more than a year of planning, the project was built by volunteers in just two weeks. Through Oklahoma City’s first community-built project, families, businesses, civic organizations and individuals who participated in the build have already touched thousands of children who have come and enjoyed the playground. The Jungle Gym will not only teach children the value of creative play, but it will also be a civics lesson about a community coming together and achieving goals. The art and hands-on experiences within the Jungle Gym give children with diverse backgrounds a chance to participate in the ultimate playground experience. The Jungle Gym experience will leave a lasting impression on all who participated in the build. It is not every day that people of all ages, from all walks of life, and with all types of talent come together to create something that everyone can enjoy. The sense of ownership and pride will continue as people visit and show others what they did to help build this playground. It took a village to make this dream a reality, and it will be a constant reminder to the citizens of Oklahoma City that the Junior League of Oklahoma City remains a vital asset to the community. 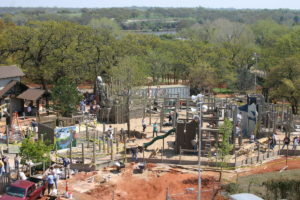 The Jungle Gym is located at the Oklahoma City Zoo. 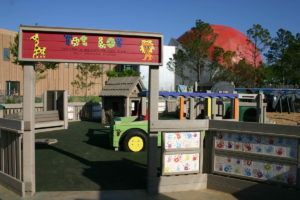 The Zoo is located at 2101 NE 5th in the center of the “Adventure Zone” of Oklahoma City. If you need directions or more information on hours of the Zoo, you may call 405.424.5108. Click HERE to see the Jungle Gym Project Photo Gallery.